Book Panama liveaboard now & pay later. We went to Panama for fun, I am a multi-sport type and Panama is a good place for a lot of activities. We also attended Spanish school in Bocas Del Toro. I made diving arrangements with Panama Divers ahead of time. We flew into Panama City and the next morning, Clay, owner of Scuba Panama picked me up at my hotel. We drove to Portobelo to a small hotel and one boat dock. It only took about 15 minutes to get to our dive spot near Drakes Island. The diving out of Portobelo is deep. Our first dive was about 110 ft (35 m). Most places I dive everything worth seeing is between 40-70 ft (12-22 m). Deep diving is just something to do. In this area of Portobelo things didn't get provocative until you hit 90+ ft (28 m). Lots of interesting corals. A couple of turtles, lobster, strange macros made for excellent pictures. Lots of spotted drums. Nothing epic but fun. Cost was $125, which made multiple dives out of my reach. The next day did a couple days of great rafting on the Changres and Chirque rivers prior to arriving in Bocas Del Toro. For surfers, there are some great surf spots in Bocas, the two I went to were bluff and bouncers. Both were Strong reef breaks, best for short boards due to the steep drops. While in Bocas I attended Spanish School at Spanish by the Sea (http://www.spanishbythesea.com) for a week. Bocas is your typical Caribbean backpackers island. Nothing real fancy. Lodging is simple and inexpensive, food around the island is varied and ok, not great, and lots of inexpensive crafts from street artists. The language school experience was excellent. Part of their program included diving. I took advantage. I dived with Dutch Pirate. Rolf (owner and instructor) is a great guy and his girlfriend/dive master Karrol is a teacher at the Spanish school (http://www.spanishbythesea.com) and used to be a dolphin trainer at Anthony's Key Resort, Roatan. We dived six different spots between Isla Colon and Bastaimentos. Diving was shallow, no deeper than 40 ft (12 m). The water was extremely calm, no currents. Almost like diving in a swimming pool. We dived one interesting wreck. Diving Panama (on the Caribbean side) was OK. Not fantastic. Fish are not "prolific". Everybody says Coiba Island is the place to dive where there are many Pelagics. Coiba was the site of a prison for many years. Now all that exists is a rustic resort. Coiba also offers excellent spearfishing for freedivers. Next time. Here are some comments on diving in Panama from our readers.
" Volcanic rocks, warm water+ 29 º and many, many fish. " " Many fish, a slight current, but incredible diving, I saw a manta !!! 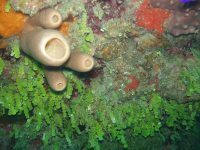 on December 23, 2009"
" Beautiful dives, excellent visibility. Rays, many fish, turtle. Also dolphins on the boat ride every time. " "The best dive we've ever done off these islands. Saw many reef sharks, and also larger 6ft sharks (? Bull), eagle rays, spotted rays, shoals of beautiful small fish as well as larger (e.g. barracuda) "
" Incredible caves, almost like a fantasy, white tips sharks !!" I just wanted to share that the diving in this area was so good, that I went to IDC then moved from Florida (also great diving) to Panama to dive Coiba and the Pacific Coast of Panama for a living. I have been here one year and have immensely enjoyed each and every dive. And there are so many unexplored areas to dive here, that I don't think I will find them all in my lifetime. Just yesterday, we dove a new site at Isla Secas which was stunning - a nice 40 ft deep dive with mild current and so much life. We had two Panamanian divers along who have lived in the area all their lives and they were speechless at how beautiful it was...they had no idea they lived so close to such natural splendor. During the boat ride we saw humpbacks breaching at a distance. I heard unusual sounds underwater that sounded like conversation and when we got back in the boat, the captain said a humpback had come nearby. What a treat for me to realize the sounds I was hearing underwater was the humpbacks communicating. Coieba Island: Best diving for sharks in the Pacific! "Great little dive shop at Hotel Contadora. Very professional and safety conscious." "We went to this island last year for 5 days to dive. Everything was arranged by e-mail. When we got to Contadora, we were told that the dive shop was closed because the owners did not feel like working. They finally asked us if we would like to dive on the last day (we were flying back to Panama City). The most unprofessional experience I have ever had with a dive operator. Would never recommend these guys to anyone. " "We are a Padi Dive Center and the nicest shop in town." "If you want to dive where no one else is at the moment, with great dives with big fish, this is the place! I think that for the quality of dives we got excellent value for money. We stayed at Seagull Cove, Boca Chica. $150 per night, quiet place, reasonable value for money. Excellent diving, definitely dive with him again. " "Very good professional responsible Divers !! In Las Perlas , with Coral Dreams we have a great time !! The Tiger boat is very fast, the equipment in good condition, cost $ 95 x two dives all inclusive. " "I dove with a group of professionals in 2006, the company called Coral Dreams. I organize my next vacation encontarar Contadora and hope to dive with these people again, really true professionals!" "ScubaCoiba Centre are located in the small village Santa Catalina (3hrs from Santiago). Excellent service and great diving experiences. " If you have more information about diving Panama we'd love to hear from you. Send us your comments below or fill in our more detailed diving location form.